July, 2016 | H&R Group K.K. Kyoto, in summer, is famed for its stifling humidity, but now as we head towards autumn and the weather cools it is a good time to visit the Imperial City and see some of the many sights – seventeen of which being UNESCO World Heritage Sites – for which it is celebrated. While the city has well organised public transport systems including low cost day trip bus passes that are perfect for visitors wanting to get around, at this time of year busses and trains can be extremely busy as every man and his dog flocks the to one time capital. If you want to avoid the crush and but see everything this beautiful city has to offer, a great idea is to join a bicycle tour. On the back of their success with Cycle Osaka, Cycle Kyoto have branched out to bring their experience of running small group cycle tours to Kyoto. Whilst understanding that hitting the big name sites is important, they also believe that it is the city – the narrow streets, the food vendors, the riverside paths – that take a great day trip and turn it into something fantastic. And when you are finished you can refresh with a shower and a cold beer at their beautiful old house just one minute from the station. Cost: 6,000 – 10,000 JPY for four and seven hour tours, respectively. 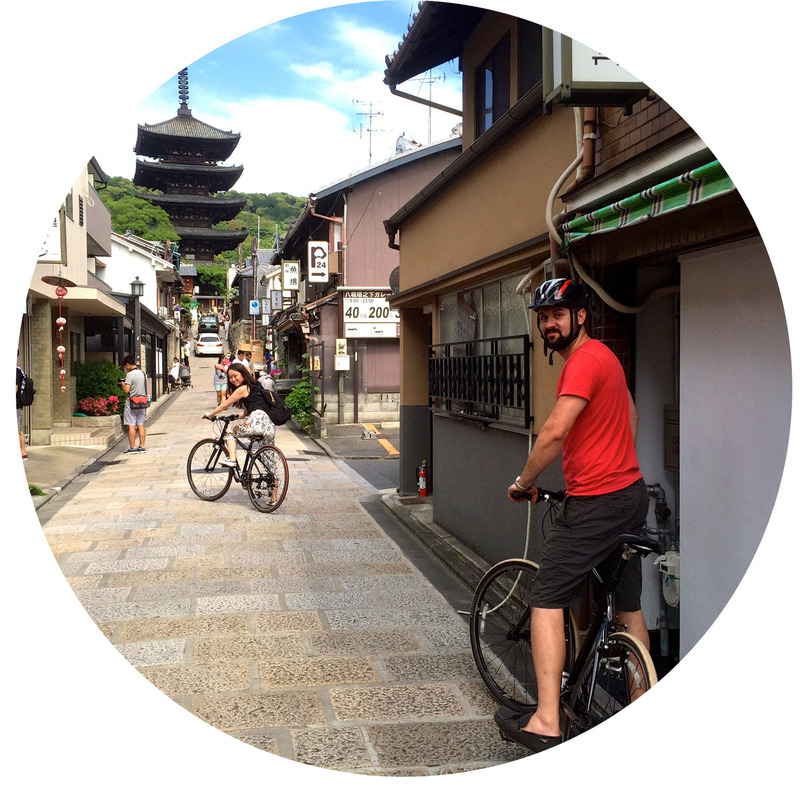 Kyoto Cycling Tour Project have various tours which take in different parts of the city. If there is a particular site you want to hit, they can take you there, or if you just want to meander the back streets, that is available too. There are five courses to choose from, or they can make a custom tour to match your requirements. Apart from the full Kyoto package, tours tend to be on the short side – up to 3.5 hours – meaning that tourists of all fitness levels can take part. Cost: Costs range from 5,500 – 15,500 JPY per person based on a 4 person tour. With operations in 124 cities across 84 countries Urban Adventures claim to offer an experience for those who want to get off the beaten path and really connect with a destination, taking travellers to interesting places to meet locals, and to really see what makes a place tick. Their 3.5 hour Kyoto tour takes in shrines, canals, the Path of Philosophy and educates on the history of the city. As one of Japan’s largest travel companies, JTB’s 15km Real Kyoto Back Street Guided Cycling Tour should be pretty efficient and well run. Each booking is limited to a minimum of two people, and takes in many shrines as well as a run along the Shirakawa river that bisects the city. Perhaps its greatest selling point is that it includes a visit to the Miyagawacho Geisha Quarters. It may surprise you to know that the Tokyo Jazz scene is one of the biggest (if not brightest) in the world. In fact, with so many cafes, bars and clubs across the capital, only the New York City scene is comparable for sheer quantity. If you feel that hunting out the best venues is something of a chore (not that you should, seeing as how we have provided you with a pretty decent introduction for your jazz-loving quest right here), then a good as place as any to start is the Tokyo Jazz Festival in September. Launched in 2002, this year sees the festival celebrate its 15th birthday, and in that time it has developed to become the largest international jazz festival in the country. Held at the Tokyo International Forum and its surrounding area, some 80,000 visitors will come to watch the 200 plus acts that hail from Japan and all over the world. With a theme of celebrating jazz “beyond borders, beyond generations” and broadening Tokyo’s cultural scene, there is a broad, diverse and eclectic (though on occasion hit-and-miss) line up, something that should appeal to jazz lovers of all tastes and affiliations. The three venues at which the festival will be held include the 5,000 seater Tokyo International Forum Hall A; the Cotton Club, a partner of the famous Brooklyn Jazz club and the unofficial center of Japan’s jazz scene; and free shows held in the Tokyo International Forum’s open-air Plaza. Amongst the international favorites, top of the bill has to be Herbie Hancock. The famed, and perhaps unrivaled pianist who was once part of the Miles Davis Quintet has long been a staunch supporter of the festival, having been its music producer from 2002 to 2005. This year he returns with an act featuring James Genus, Lalah Hathaway, Trevor Lawrence Jr and Terrace Martin. Another leader of the American jazz scene in attendance is Kenny Barron, one time pianist for Dizzy Gillespie and considered one of the most important and influential mainstream jazz pianists since the bebop era. Other international acts to look out for include five time Grammy Award winning bass virtuoso Christian McBride performing with prog-Jazz guitarist Pat Metheny; the bossa nova and jazz funk crossover star Sérgio Mendes; and the Argentine Pablo Ziegler, the current leading exponent of the nuevo tango scene combining with Japanese violinist Naoko Teria. But it isn’t just the international acts you should be keeping an eye out for. Hiromi Uehara, known for her energetic live performances is one to watch. If her blend of musical genres such as post-bop, prog rock, and fusion is a little modern for your tastes, then you should head over to famed bossa nova saxophonist Sadao Watanabe, who has a recording history as long as your arm, 13 albums of which have hit the US Billboard top 50. Tickets: Prices vary. See website for details. While sitting in your air conditioned room, sheltering from the humidity outside, perhaps the last thing that you would be thinking of doing is sinking into a nice hot bath. It seems somewhat counter productive, doesn’t it? However, here in Japan there is a train of thought that says that it the heat of an onsen bath is the perfect remedy for clearing our those sweaty pores and the grime from the daily grind. Which is why, as part of our Day Trips From Nagoya series, we recommend heading out to Gifu Prefecture’s beautiful spa town of Gero, and in particular its Festival of Fire. Taking place from the 1st to 3rd of August every year, the Gero Ryujin Fire Festival is the largest of the city’s fireworks calendar. According to the Gero legend of “Wankasebuchi,” on the first day of the festival five dragons make their way through the city. The highlight of the event is when these dragons perform original dances, whirling about amongst sparks of fire on the Shirasagi Bridge. On the second day, mikoshi (portable shrines) are paraded with samba dancing team follow them through the streets of Gero in bright colourful costumes. The last day of the Gero Onsen Matsuri (Gero Onsen Festival) sees brilliant fireworks shot into the sky in time with a musical accompaniment as dancers once more take to the streets. If you can’t make it to the festival, the city has plenty to offer all year round. Gero is located about 90 minutes or so from Nagoya, about an hour south of Takayama. It is one of the most famous spa towns in Japan, and was referred to as one of the country’s three best onsen by the Confucian poet Hayashi Razan. If you want to take advantage of the healing qualities of the waters, there are three public bath houses available in town, and at the south end of the Gero Bridge is a large ‘rotenburo’ (open-air bath) in which you can bath for free (though bear in mind that it has no facilities and is exposed to the bridge above). There are also many Japanese hotels, or ‘ryokan’, that offer bathing facilities, some of which have private baths, meaning that you can share with friends of family members of mixed sexes (the regular communal onsen baths in Gero, like most of Japan, require the separation of men and women). Most of these ryokan offer lunch and bathing packages in which you can dine in a private room before going for a soak in the steamy waters. Out of the baths, and up a long stone staircase, is Onsenji Temple, dedicated to Yakushi Nyorai, the Buddha of healing, whose image is credited with restoring the flow of hot spring water to the town after it was blocked by a large earthquake. From the temple gate you can command a beautiful view of the city as well as the Hida River below. Just above the town is Gero Onsen Gassho Mura, an open air village museum of gasshozukuri farmhouses, traditional steep, thatched roofed houses from the Shirakawago region. Here you can view the houses, see performances, or participate in traditional folk art. If you are lucky, one such participation may include being served a traditional, sweet ‘raw’ form of sake that is local to the area. An interesting point of note is that the word ‘gero’ is the same as the sound that Japanese consider frogs to make (‘gero gero’ as opposed to ‘ribbit ribbit’). As such you will see adorable portrayals of the amphibious creature all over the city – adorning park benches, manhole covers and walls – and, of course, within the many tourist shops. If you are unsure about onsen etiquette, check out our onsen do’s and dont’s list here. If you want to check out other fireworks festivals in the area, we of course have a list here. One of the most entertaining evening activities during the summer months in Japan is enjoying drinks from one of the many glittering rooftop beer gardens that light up in the cities. With prime views of the lively streets and the quiet river, choosing any one of Kyoto’s beer gardens is sure to make a lovely summer night for you and some friends or coworkers. Though any rooftop restaurant in the ancient capital would be wonderful, for a limited time in August, dining and drinking at the Miyagawa-cho Beer Garden will also provide you with a unique cultural experience that shouldn’t be missed. Being that the Miyagawa-cho neighborhood is one of Kyoto’s five geisha districts, it would only be fitting to serve up some rooftop brews with some of the traditional entertainment famous in the area. For the first few weeks of August, head over to the Miyagawa-cho Beer Garden for a summer special of refreshments accompanied by traditional geisha and maiko performances. Located next to the Kaburenjo theater, a historic theater famous for providing geisha performances throughout the year, this beer garden is in the optimal place to experience the magical art of the geishas. Limited seating is available in the evenings between 6:00 p.m. – 7:30 p.m. and 8:00 p.m. – 9:30 p.m., so be sure to make a reservation and arrive early! You can receive a tasty dinner meal and all-you-can-drink beverages for ¥5,000 with talented geishas as your hosts and entertainers. During the meal, you will be entertained by various traditional performances by the maikos and geishas such as dancing, singing, and instrument playing. The garden is a relatively new addition to the neighborhood, and it was implemented by community members and groups who believe in preserving Kyoto’s history and making it accessible in the modern day. Never fear! This summer there is plenty to do in Hiroshima and the interactive exhibition by the creative people at teamLab will no doubt keep both children and adults alike entertained for a good while. The Tokyo-based company, teamLab was founded back in 2001 by Toshiyuki Inoko. It brings together a multi-disciplinary group of people who refer to themselves as ‘ultra-technologists.’ By combining technology, art and design with the natural world around them, they create interactive pieces of art that are exhibited both within Japan and overseas. This summer Hiroshima is lucky enough to be hosting one of the team’s exhibitions at the NTT Cred Hall, which is located on the 11 floor of Pacela next to SOGO department store. The Hall is famous for its summer events, with last year’s aquarium being a real hit with everyone who attended. This year’s event will feature numerous installations including a Crystal Universe and a Sketch Aquarium that involve audience participation and different forms of interaction such as touch. Although the Crystal Universe is aimed primarily at adults, children are sure to enjoy it as well. By walking through a ‘forest’ of LED lights you are able to alter the Universe and you are also able to make changes by selecting elements and swiping towards to the installation via your smartphone. The event opens on Wednesday July 27 and will run until Sunday September 4 so there’s plenty of time to go again if you… I mean, the kids, enjoy it. Tickets can be purchased in advance at 7-Eleven at a cost of 1000 yen for adults, 700 for junior and senior high school students and 500 yen for children. You can also buy tickets at the door but these are slightly more expensive at 1200, 800 and 600 yen respectively. The exhibition is open between 10am and 8pm every single day, with the last admission at 7.30pm. If you and your family are looking for a famous sightseeing place with beautiful scenery, then look no further than Iwakuni, in Yamaguchi Prefecture. It’s an easy day trip from Hiroshima and has something to suit the whole family, from castles, to lucky white snakes and ice cream of every flavour imaginable. Of course, the most famous attraction of the area is Kintaikyo, a picturesque bridge that spans the Nishiki River. Built in 1673 by the feudal lord of the region, Hiroyoshi Kikkawa, it was washed away soon after, but rebuilt again. For 276 years it survived unscathed until a typhoon in September 1950 destroyed it once again. Construction began in 1953 and the present bridge was restored between 2000-2003. At a length of 193.3m with a width of 5m and a height of 6.6m, it is an impressive sight. The riverside is the perfect place for a picnic or bento lunch and the kids can entertain themselves by paddling in the water under the bridge. It’s especially great on a hot summer’s day. The bridge is beautiful in all seasons, but particularly in spring when the cherry blossoms are in bloom along the river. On April 29 there is also the annual Kintaikyo Matsuri or Kintaikyo Festival, which celebrates the return of the feudal lord from the capital of Edo. If you like traditional music and costumes, it’s definitely worth a visit. Tickets for the bridge are available at the reasonable price of 300 yen for adults and 150 yen for elementary school students. If you are interested in visiting Iwakuni Castle, located on the top of the hill behind the bridge you can also purchase a set ticket for 1100 yen for adults and 520 yen for elementary students. This of course includes not only the bridge and the castle, but also the ropeway for accessing the castle. I would highly recommend buying the set ticket as the view from the castle is well worth it. Before heading to the castle, however, make sure you stop by to see the white snakes, which are not only native to the region, but are considered to be very lucky. On your return, treat yourself and the kids to an ice cream. With over 100 flavours you’re sure to find something you want… or don’t want. Natto or curry flavour anyone? Iwakuni can be accessed via the JR Sanyo Line. From Hiroshima Station it takes approximately 50 minutes and will cost 760 yen. You will then need to take a bus to the bridge, which is located about 15-20 minutes away and costs 300 yen. The bus is located right outside the station and there are plenty of signs in English to help you find your way. In a world where construction projects grow higher, longer and bigger by the day, the Akashi-Kaikyo Bridge is practically a dinosaur. The world’s longest suspension bridge is now 18 years old. The bridge actually requires three spans to cross the Akashi Strait and link Kobe and Awaji Island in Hyogo Prefecture. The total length of the Pearl Bridge, as it is more commonly called, is 3911 metres with a central span of 1991 metres. The Akashi-Kaikyo Bridge was over ten years in the making and is still considered the greatest engineering feat in Japan. The obstacles in its construction included strong tidal currents in the inland sea, winds that can whip through the strait at speeds over 60 metres a second and the omnipresent possibility of earthquakes. The solutions to these problems involved newly developed technologies by the Japanese builders. The world’s largest wind tunnel was constructed to test the bridge design which included a central span that was twice as long as any previous suspension bridge. Nature tested the massive foundations built in waters up to 60 metres deep when the Kobe earthquake struck on January 17, 1995. The towers stood strong but they moved apart by about one metre which required an audible to be called on fabricating the bridge’s girder length. Designers built the Akashi-Kaikyo Bridge to last 200 years. The techniques employed can be used to build bridges with spans up to 2,500 metres but so far no such bridges have been constructed. The Akashi strait is one of the busiest waterways in Japan, with some 1400 ships a day passing between Osaka Bay and the Seto Inland Sea. Until the Akashi-Kaikyo Bridge many of those ships were ferries transporting passengers and vehicles. In 1955 two of those ferries sunk in a storm at the cost of 168 lives. After that the Japanese government began making plans for a suspension bridge across the strait. So as not to impede the important shipping channel, the bridge had to be constructed with a 65-metre clearance over the sea. The resulting towers to make this happen soar 300 metres above the waves. Other than driving across, there are several options for enjoying the Pearl Bridge. Maiko Park on the waterfront at the foot of the bridge features a walking path on a concrete seawall that winds into a pine forest and includes the one-time residence of Sanji Muto who founded Japan’s first newspaper advertising agency and then descended into politics. Also here is Sun Yat-sen Memorial Hall, an octagonal frame building that is dedicated to the life and works of the founding father of the Republic of China. It is the only museum in Japan marking the Chinese revolutionary. You can also go on a guided tour of the majestic bridge that takes you along grid deck maintenance paths 50 metres above the water and culminates in a lift ride 98 stories to the top of the 300-metre Akashi-Kaikyo Tower for a view across Osaka Bay and seemingly most of Japan. Participation is limited and reservations are required. If you want to learn about the relevant background of the bridge you will have to know Japanese but for the most part the Pearl Bridge speaks for itself. As you are probably by now only too well aware, summer certainly swelters here in Japan. This of course brings a multitude of problems, such as how to deal with with hot and sticky public transport, which isotonic sports drink to chug to replace lost minerals due to continuous sweating, and how you can drag yourself away from the air-conditioned haven of your office or home. Another problem that arises in Tokyo’s summer heat, particularly if you have a young family, is finding entertainment activities that wont leave everyone feeling fried and frazzled. If this sounds like a problem you encounter, why not try out one of the many outdoor swimming pools and water parks in the Tokyo area. Not just a clever name, Summerland is an amusement destination that offers summer all year round, which possibly means that, with it being summer right now, it is double summer! Well double summer means that the outdoor ‘Adventure Lagoon’ area is open and you can enjoy giant waterfalls and floating down ‘the Looooong Lazy River’. The more adventurous of you can try the ‘Screamer Water Slides’. Be warned, double the summer means double the people and it can get extremely busy at peak times. This is by no means an understatement. With a name like ‘Hydropolis’ you would expect something pretty spectacular and here, at the outdoor pool complex at Toshimaen Amusement Park, that’s precisely what you get. There are two wave pools, a surf pool, a lazy river and some seriously blood-twisting water slides including ‘Bodyride Mountain’ and ‘Thrill Slide Tower’. For children there is a set of kiddie pools and for dedicated swimmers there is a 50m olympic sized pool combined with three diving boards. Part of an enduringly popular amusement park, the Pool WAI at Yomiuri Land has a whopping five pools and three water slides, including the rubber ring ride ‘The Giant Sky River’ that stands at 25m high and runs for 386m. If that is a touch too thrilling for your disposition you can play it safe in the Anpanman pool. There are special events throughout the summer including music performances and synchronised swimmers, after which adults can enjoy the night time beer garden on the nearby lawns. If you check with your local ward office, you will probably find that there is a cheap and convenient outdoor pool that is run by your local community. However, whether you live in the area or not, the residential pool at Meguro Citizens Center is definitely worth checking out. Just a short walk from Meguro station, as well as a toddler pool there is a large 50x25m pool that has lanes for swimmers plus an area for frolicking with floating devices and beach balls. Popular with families and, on weekends particularly, a young adult crowd. Perhaps you are after something a little more serene, away from the wave machinces and boisterous teens. 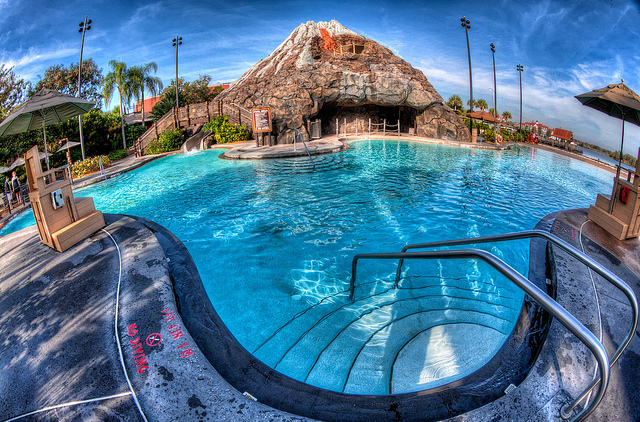 If this is the case, then Aqua Field Pool may be more what you have in mind. With a fantastic view of the nearby Tokyo Tower, this 50m outdoor pool has two lanes for swimming lengths, and a further section for general frivolity. After your swim you can enjoy the view of Zojoji Temple as you dry off from a chair on the raised terrace. Cost: Adults 400 JPY for two hours; Children 200 JPY. An Additional 200 JPY per further hour. Cheers to Summer in Hiroshima… and Miyajima Beer! Summer in Hiroshima means fireworks, summer festivals and beer. Granted there are many wonderful beer gardens to relax at on a hot summer’s night, but many people forget (or don’t know) that the island of Itsukushima, commonly known as Miyajima, has its own patio (i.e. beer garden) where you can enjoy the view while you sip that golden ale. Locals, of course are familiar with Miyajima Beer, but newcomers to Hiroshima might not initially be aware of this. The beer is brewed on the island itself at Miyajima Brewery. As for the beer garden, aka patio, it can be accessed via the main island frontage or from the back entrance located just off Omotesando, at the far end of the street, closest to Itsukushima Shrine. There are a few different varieties of beer, with the Miyajima Pale Ale and Miyajima Caramel Blonde being the two most popular ones. In some department stores and specialty supermarkets there is a Weizen or wheat beer one as well. Miyajima Beer is not sold at all supermarkets unfortunately and cannot be found at convenience stores, so usually a trip to one of the local department stores such as SOGO, Mitsukoshi or Fukuya is required. I did, however, recently discover another variety called Miyajima Pale Ale Bitter & Sweet, at my local supermarket. Each variety of beer has a slightly different taste and rather than describe them for you, I recommend that you just try them all out for yourself! Now of course, if you don’t feel like mixing with the crowd at the Miyajima Beer Patio, there is always the option of finding a spot to sit on the beach or on the rock wall that surrounds the front of the island. Despite the fact that summer is not the height of oyster season, oysters are plentiful at Miyajima and are the perfect food to compliment your beer. I would recommend the grilled oysters, which are simple, won’t overpower your beer and won’t they leave any aftertaste that will spoil your next drop. Served with a slice of lemon, the oysters are slightly salty, not too heavy and will definitely satisfy your hunger, yet still leave room for another beer. Both the beer and the oysters can be found along Omotesando, the main shopping street or arcade, which is located approximately three minutes walk from Miyajima Pier. The prices differ slightly from shop to shop, with one beer costing approximately 500 yen and two grilled oysters in their shell for about 400 yen. For more information on the island itself and other activities that don’t include beer, you can visit the Miyajima Official Tourism Website, Hiroshima Prefecture, Japan at www.visit-miyajima-japan.com (English, Chinese, Korean, French and German) or the Miyajima Tourist Association at www.miyajima.or.jp (Japanese, English, Chinese, Korean, French and German). Pigs are sacred in Egypt. Cattle are sacred in India. Goats are sacred in Syria. Elephants are sacred in Thailand. In Nara the animals worshiped are deer. Deer have been roaming the Kasuga Hills in these parts since before there was a written language, before there was a Japan. When Nara was established as capital of Japan in the 8th century, the deity Takemikazuchi-no-Mikoto rode into town on the back of a white deer. More than a mode of transportation, the deer was immediately adopted as a divine symbol. Paintings of future deities often depicted the subjects mounted on similar white deer. Many of the medieval paintings, known today as the Kasuga Mandala, just featured the sacred animals alone. The deer that roamed the streets of Nara were not only considered sacred but their status was codified into law. As protected animals, the penalty for anyone caught killing a deer was death. That prohibition was so old that many later government officials considered the capital offence to be folklore. But in the 1800s there were still people being arrested for crimes against deer although the last official enforcement is considered to have taken place in 1637. It was a sure indication that Japan had signed on to the modern world when the divinity of the Nara deer was officially revoked after World War II. The herd still retained its protected status even though no one will be put to death for harming a deer. They are considered a living national treasure. What exactly are the Nara deer? To a biologist, the Nara deer are known as sika deer. They are commonly referred to as “spotted deer” or sometimes “Japanese deer,” even though their native range covers most of East Asia. While many deer are spotted when young, the sika deer keeps the spots throughout their lifetime. The sacred status has enabled the deer to thrive in Japan while their numbers have been greatly reduced elsewhere. The elimination of the wolf, the deer’s primary tormenter, on the islands has been a big factor as well. The herds have also been trimmed in China, where they once roamed in abundance, by practitioners of traditional medicines who use the velvet antlers in potions. Japan is the only Asian country that does not harvest deer for medicine. Japan harbors the largest population of native sika deer in the world. An estimated 100,000 animals are on the islands, so many that pressure is being exerted on farmlands and forests. In some places the population is being controlled instead of conserved. Not in Nara. The Nara herd numbers about 1,200 animals. Their main hangout is Nara Park where the mostly tame creatures enjoy handouts of “deer crackers” from tourists that can be purchased for that purpose. The deer roam free and it is not unusual to see them spill out in to the surrounding roadways where they wander among traffic and relax in the medians. One tradition holds over from their days as sacred animals – people bowing to the deer. And more often than not, they bow back.